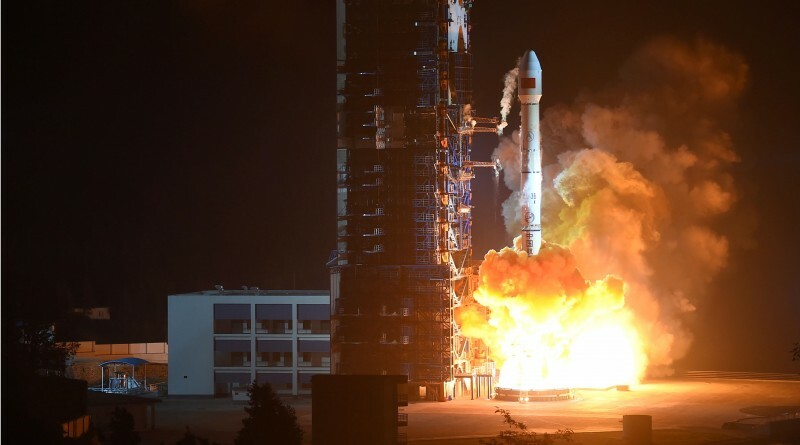 A Chinese Long March 3B Rocket blasted off from the Xichang Satellite Launch Center on Monday, lifting the Gaofen-4 satellite into orbit to have a watchful eye on Planet Earth, becoming China’s first remote sensing satellite operated from Geosynchronous Orbit. Closing out a year that saw 87 orbital space launches, Long March 3B lifted off at 16:04 UTC to perform a standard ascent mission lasting a little under half an hour to drop the satellite off in a highly elliptical transfer orbit. An announcement confirming launch success came forward later in the day via official Chinese media. With Monday’s successful launch, China is overtaking the United States in the number of successful orbital launches carried out in 2015 with 19 fully successful missions, marking another perfect year for Chinese orbital spaceflight. While conducting 20 launches this year, American rockets suffered a pair of failures – a Falcon 9 disintegrated in the skies over Cape Canaveral shortly after lifting off with the Dragon CRS-7 cargo craft in June and the inaugural launch of the Super Strypi small-satellite launcher failed in November about one minute after blasting off from Hawaii. Russia remains in the lead in 2015 with 29 orbital launches and 26 successes, maintaining its leading position for over a decade, though going through a bit of an up and down in 2015 as both of Russia’s workhorse launchers, Soyuz and Proton, had to deal with failures over the course of the year. European rockets flew nine times this year while India conducted five successful orbital launches and Japanese rockets made four flights, including the country’s first fully commercial mission. Iran conducted a single orbital mission in 2015 bringing the year’s total to 87 missions with five failures, trailing last-year’s 92 launches that set a record for the current century. The Gaofen-4 Satellite joins the China High-Resolution Earth Observation System CHEOS, a fleet of Earth observation satellites operated from different orbits and carrying a variety of sensors to gather relevant data products similar to the American Landsat and European Copernicus programs. CHEOS has the goal of making data readily available to users to create an operational Earth Observation Satellite System. The spacecraft are equipped with a variety of sensors from high resolution, multispectral optical imagers to radar payloads, infrared imagers and microwave payloads as well as specific sensors. 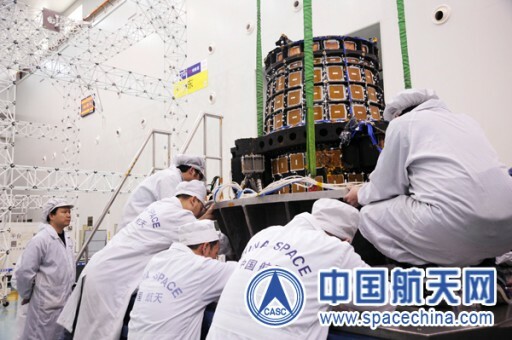 Satellites belonging to CHEOS will be operated in different orbits including Low Earth Orbit and Geostationary Orbit to create a range of data products at different qualities and revisit times. The primary data users of the program are the Ministry of Land and Resources, the Ministry of Environmental Protection, and the Ministry of Agriculture. The first Gaofen satellite was launched in April 2013, hosting a 400-Kilogram optical imaging payload comprised of two High Resolution Cameras and four Wide Field Imagers. The High Resolution Imagers reportedly cover a ground swath of 69 Kilometers and reach a ground resolution of two meters in the panchromatic band and eight meters for multispectral imagery. The Wide Field Imagers reach a 16-meter resolution but cover a larger ground swath of 830 Kilometers with sensors sensitive in four wavelength bands. Gaofen-2 headed into orbit in August 2014, outfitted with a single High-Resolution Optical Imaging Payload achieving a ground resolution of 80 centimeters in Panchromatic Mode across a 48-Kilometer swath. Multispectral products from the satellite reach a 3.2-meter resolution. 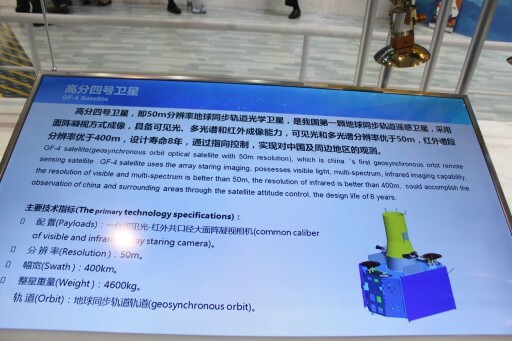 Gaofen-3 has yet to launch and will deploy a C-Band Synthetic Aperture Radar for all-weather and nighttime imaging at a targeted ground resolution around one meter. The Gaofen-5 satellite is expected to launch next year, carrying a suite of six payloads that include a hyperspectral camera covering visible and shortwave infrared wavelengths, a spectral imager, a greenhouse gas monitoring payload and an infrared detector, a trace gas spectrometer and a multi-angle polarization detector. Gaofen-6 will be a copy of Gaofen-1 to replace it in 2016, at the end of its planned in-orbit life. Further down the road, Gaofen-7 will fly a hyper-spectral stereo imaging payload currently penciled in for launch no earlier than 2018. Originally, Gaofen was outlined as a program comprised of seven satellites, however, 2015 saw the launches of Gaofen-8 and 9 – likely representing additions to the original constellation in what is a suspected merger of military and civilian programs. 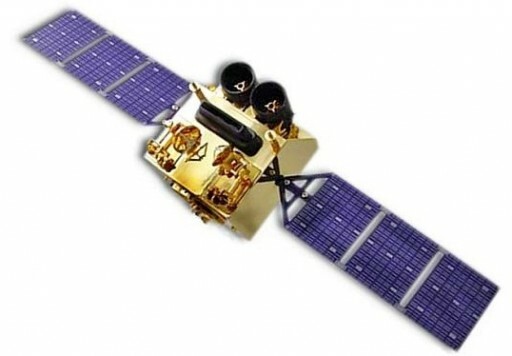 The two additional satellites likely originate from the Yaogan military reconnaissance satellite series operated exclusively for military applications while the Gaofen satellites are most likely employed as needed for civilian and military purposes – matching the capabilities of Yaogan in terms of ground resolution. 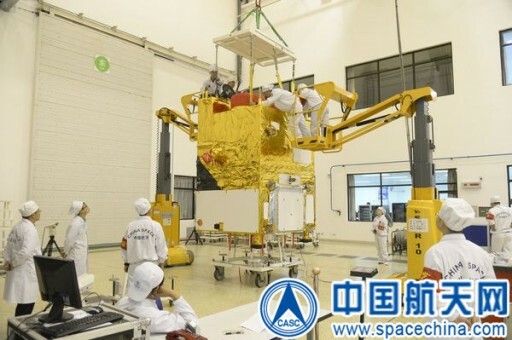 Gaofen-4 stands out within the CHEOS program as it marks the first time China deploys a Remote Sensing satellite to Geostationary Orbit from where it can deliver around-the-clock imagery of areas in China and surrounding territories. The 4,600-Kilogram satellite makes use of a hexagonal platform with two two-panel solar arrays for power generation and a large optical baffle on its Earth-facing deck. The Gaofen-4 satellite is outfitted with a staring imager hosting a common optical system focusing light on a visible and infrared detector system. The staring camera has to be pointed to the desired location on Earth and can capture frames around 400 x 400 Kilometers in size. A ground resolution of 50 meters is achieved in the visible wavelengths while the infrared imager reaches a resolution better than 400 meters – realizing a resolution better than current staring imagers deployed to Geostationary Orbit. Being sensitive for infrared wavelengths permits the satellite to complete nighttime imaging operations. The primary driver of the Gaofen-4 mission is the acquisition of imagery at extremely high temporal resolution, essentially only limited by the time needed to slew the satellite between different targets and downlink data rates/latency. Multi-band imagery delivered by the spacecraft will be used in various applications including disaster monitoring, meteorological observations, environmental monitoring, agricultural planning and national security. The satellite will be employed in the detection of hot spots, to deliver warnings for major weather conditions such as local areas of strong convections and typhoons. Likely to be stationed at 110 to 112°E, areas covered by the satellite include the entire Chinese Territory, the Asia-Pacific Region including Australia, and entire Indian Subcontinent and surrounding regions as well as Kazakhstan and portions of Russia. 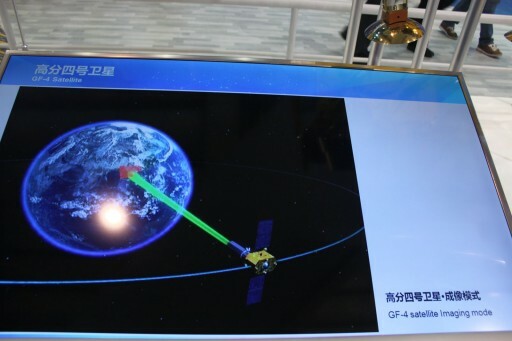 Media reports issued prior to the launch of Gaofen-4 also indicated that the satellite may come to use in maritime monitoring, tracking the moves of large sea-going vessels including aircraft carriers. 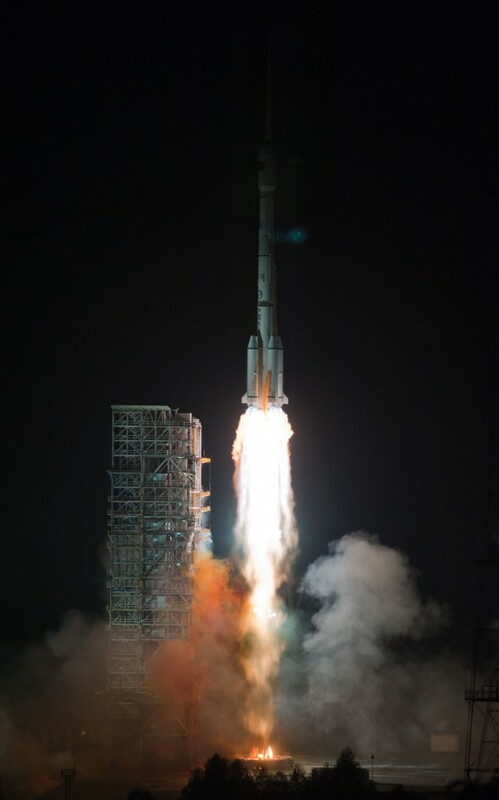 Lighting up the night over the Xichang Satellite Launch Center, the 56.3-meter tall Long March 3B blasted off just after midnight, at 0:04 a.m. local time on Tuesday – ascending vertically with a total thrust of 604 metric ton-force supplied by its four boosters and central core stage. 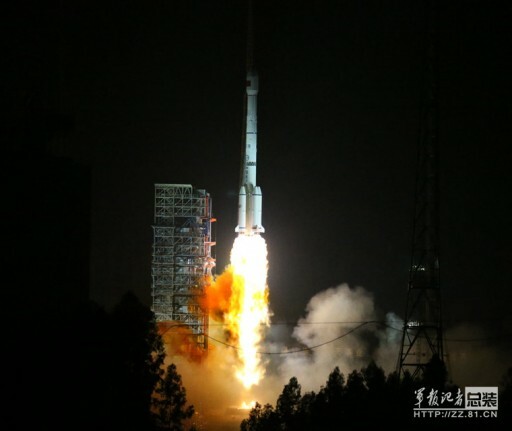 Swinging to the south-east, the 456,000-Kilogram rocket was set to overfly the Yunnan, Guizhou and Guangxi provinces, the Gulf of Tonkin, Hainan Island and out over the Pacific Ocean. The four boosters, 16.09 meters long and 2.25 meters in diameter, were to fire for two minutes and 20 seconds – each delivering 740 Kilonewtons of additional thrust and burning through 41,100 Kilograms of hypergolic propellants. After separation of the boosters, the vehicle was to continue ascent powered by the core stage alone, fitted with a four-chamber DaFY-6-2 engine cluster providing 2,961 Kilonewtons of thrust. The stage stands 24.76 meters tall and holds 186,200 Kilograms of propellants at liftoff enabling it to burn for 158 seconds. Separation of the stages was planned to occur in hot mode, starting with the ignition of the second stage’s vernier engine and followed by the firing of cutting charges to allow the second stage to pull away from the spent core for main engine ignition. The 12.9-meter long second stage, holding 49,000kg of propellants, was expected to burn for nearly three minutes with a total thrust of 742 Kilonewtons. Assuming control of the flight, the third stage was to ignite its YF-75 dual engine cluster that, unlike the other CZ-3B stages, burns Liquid Oxygen and Liquid Hydrogen. Generating 157 Kilonewtons of thrust, the third stage was to burn through 18,200 Kilograms of cryogenics over the course of two burns to raise the apogee of the orbit and achieve a Geostationary Transfer Orbit for spacecraft separation just over 26 minutes into the flight.